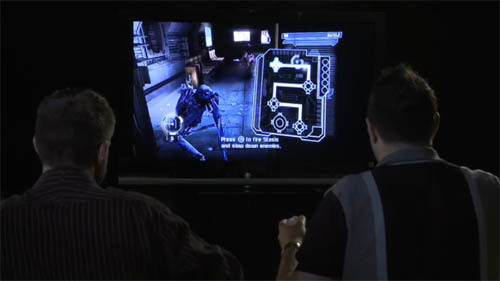 What you see above is a screen grab from the "controls" video for Dead Space Extraction, the two player co-op title coming out for the Wii this September. What you might not garner from the screen grab is a unique cooperative moment in the game. Players are required to alternate solving the puzzle on the right side of the screen, while the other player fends off waves of attackers. This co-op moment is something not present in the single player game, and when you see it in action, you'll understand how it works. Above and beyond the video shows plenty of in game action, a game that looks surprisingly good for the Wii. Check out the video below and let us know what you think - I know it just jumped up on our radar a few notches!